Unless you’re a camel, carrying all the water you need when you’re on an outdoor adventure isn’t comfortable or practical. Fortunately, having a lightweight, portable water filter can turn any natural outdoor water source into fresh, drinkable water. We’ve taken a closer look at the best portable water filters to help you find the one that’s right for you. Every filter on our list filters out at least 99.999% of contaminants like cryptosporidium parasites and bacteria, and each passed FDA tests with flying colors. Our main goal was to find the most durable, packable, user-friendly devices to keep you hydrated and healthy on the trail. 1.75 oz. 15 oz. 11.5 oz. 8 oz. 2 oz. 3 oz. 16 oz. 1.9 oz. 8 x 1 in. 16.5 x 4 in. 11 x 7 x 3 in. (packed) 6.5 x 3 x 1 in. 5.5 x 1 in. 9.5 x 4 x 3.5 in. 7.5 x 2.5 in. 6.25 x 1.2 in. This popular water filter may seem over-promoted, but it lives up to the hype. It’s inexpensive, small, lightweight, easy to use, and can filter up to 1,000 gallons of water with proper care. Its filtration levels aren’t as high as some of the other portable water filters on our list, but they’re still well within safe levels. We also like that for every LifeStraw you buy, one child in need gets fresh drinking water for a full year. 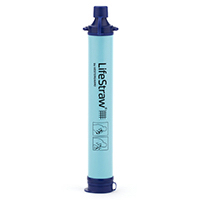 Be sure to read the directions and fully submerge the LifeStraw filter before the first use, otherwise you’ll be puckering up without much liquid reward. Because you’re not a camel, you’ll also want to bring a water bottle or other container to catch water in so you won’t have to bend down to drink directly from a lake or stream. The Katadyn Vario gets its name from its various settings. If you’re filtering cleaner water, you can adjust for a faster flow, but if you want to help your filter last longer, you can opt for a setting with a slower flow. One of our favorite features of this filter is its dual-pump technology. It uses an easy-to-pump lever that pulls in water both when you lift the lever and when you push it down, making the Vario one of the most efficient filters on our list. Within minutes you can get plenty of clean water to all the thirsty members of your group. 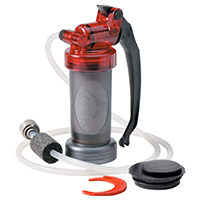 We also like that you can use the hose attachment to fill a water bladder (like a CamelBak) or a regular water bottle. You can also fill a wide-mouth bottle (like a Nalgene) with safe drinking water by screwing it directly to the filter. Pumps and straws are great for on the go, but what if you’re staying put for a while and need water for cooking? 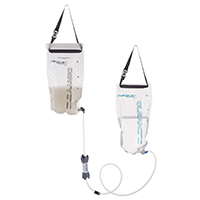 The Platypus GravityWorks’s dual bag, set-it-and-forget-it operation is ideal for getting fresh water to your campsite. Just fill the bag labeled “dirty” with water from a natural water source, then hang it up on a tree and let the gravity-fed filter do the rest. The Platypus can filter four liters of water in less than three minutes, so by the time you’re finished building a fire for s’mores, your fresh water will be ready to go. The only complaint we have with the Platypus is that the filter for dirty water is at the bottom of the bag where all the silt settles, so it does clog fairly easily. We recommend collecting dirty water in a separate water bottle and letting the silt settle a bit before filtering. We also recommend reinforcing the holes where the straps pass through the bags for hanging, as the plastic around them can weaken and tear through after a few uses. If you’re more worried about what you can’t see in the water, the Survivor Filter Pro has your back. It has a 0.1-micron pre-filter and a 0.01-micron internal filter, giving it the best filtration of any portable water purifier on our list. 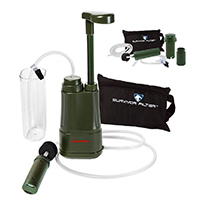 The Survivor Pro even filters out viruses, which most portable water filters don’t. But those high levels of protection come with drawbacks: you’ll be cranking out only about a half liter of fresh water per minute, and you’ll work up even more of a thirst operating the push-pull pump. 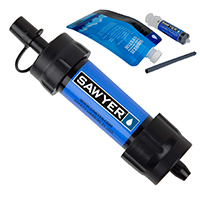 Sawyer Mini’s impressive filtration capacity of 100,000 gallons earned it our “best lifespan” designation. We’d be surprised if anyone ever actually needed to drink 100,000 gallons of water, but it’s nice to know that it’s an option. We like that it comes with a food-grade water pouch for collecting dirty water and squeezing it into the filter, but the bag is so stiff that it makes it hard to get it filled from a lake or other non-moving water source. We also found that the O-ring that creates a seal between the bag and filter doesn’t hold up well over time. The filter will still work—you’ll just experience some spillage. Like the Sawyer Mini, the Sawyer PointOne Squeeze has the same stellar Sawyer lifespan. 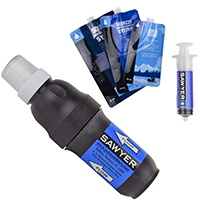 But it has a larger filter surface area than the Sawyer Mini, giving it a faster flow rate so you can squeeze out those 100,000 gallons even faster, and it comes with a push-pull sport cap for easy drinking. We like that if you get tired of squeezing the pouch (and you will get tired of it) you can set it up as a hands-free, gravity-fed system. Keep in mind that it’s a bit bulkier than the Mini, and it also has the same gasket issues we found with the Mini. The lever action pump on the MiniWorks means no sucking or squeezing, but you do have to be careful of clogs. If you get too overzealous with your pumping when the filter is backed up, you could break the filter cartridge. Fortunately, unlike other filters that require syringes for cleaning, the MSR MiniWorks can be cleaned out in the field, no special tools required. When it’s time to pack up and go, just wrap the tubing around the pump and secure it with the included clip. 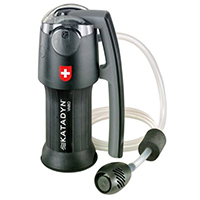 The MSR is rated as one liter per minute, but we found that to be a generous estimate, so it’s best used as a one-person pump. At around only $15, the Etekcity is a great buy. It has the same basic functions as more expensive filter straws, but with the expected drawbacks of a lower price point. It will only filter around 400 gallons of water at a rate of less than half a liter per minute. 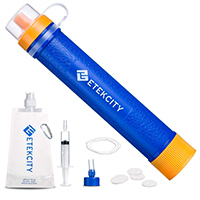 That rate slows down when you’re trying to filter even small particulates like sand through the straw, so you may want to think of the Etekcity as more of a slow sipping experience. It comes with a syringe for cleaning, but the syringe is tiny, so cleaning it can feel a bit like using a thimble and a Q-tip to scrub your bathroom floor. What are some harmful contaminants in water? Water contaminants can be either chemical or physical, and include sediment from soil runoff and the chemicals that stick to the sediments like gum on the bottom of a shoe. Animal and human waste that can spread bacteria and protozoa may also be found in natural water sources, and algae and other water molds can contain harmful bacteria and protozoa parasites as well. Viruses may also be present in natural water sources, though they’re uncommon in water in North America. Any of the above can have you spending more time on the porcelain throne than you’d like. What are other options for portable water purification besides water purification filters? Halazone tablets, chlorine tablets, and chlorine dioxide contain chemicals for effective water purification—but chemical treatments can take up to 30 minutes to fully clean the water of bacteria and protozoa, making them less than ideal for the thirsty hiker. When used frequently, water treatment chemicals can also attack healthy bacteria in your body, so they’re not recommended for extended use. Other effective methods of water purification include processes using UV light and distillation. Do water purification filters work on water with chlorine and other chemicals in it? Filters are more effective on physical contaminants and microscopic bacteria, because chemicals dissolve in water. But a ceramic or charcoal filter can help to reduce the odor and taste of chlorine. How many liters of water should I drink a day? Most experts agree that two liters of water a day, or half a gallon, is enough to stay hydrated. But if your only goal is to not die of dehydration, you’ll need about one liter per day to avoid becoming a dried-up human shell. How do I decide which type of water filter is right for me? The most important thing to consider when choosing a portable water purifier is how you’ll use it. If it’s just a doomsday backup device, then a small, inexpensive filter will do the job. But if you’re planning to use it for regular backpacking excursions, you’ll want something that can handle more frequent use. If you’re the designated water provider for your group, look for a filter that has a higher flow rate. If you know you’ll be in areas with more polluted water sources (near nuclear power plants or cattle farms, in foreign countries, etc.) you may want to choose a filter that’s tough enough to eliminate viruses as well as other common contaminants. Follow the manufacturer's instructions to clean your filter after each use, either by back-flushing or by scrubbing the filter. Avoid using soap in your filter unless you want a bubbly surprise the next time you use it. Store your filter in a temperate climate, as water trapped in a filter's pores can expand when it freezes and break the delicate fibers. Let water pouches sunbathe with the opening up to dry them out and prevent mildew in between uses. To find the best portable water filters, we looked at the most recommended brands and compared unbiased reviews by backpackers and emergency preparedness experts. We studied how each filter operates to find the most efficient devices on the market. Find out more about our methodology.